Himalaya's Extra Moisturizing Baby Soap is designed to effectively manage infantile xerosis or excessive dry skin in babies. Indian Aloe, Almond Oil and Olive Oil work together to nourish and maintain the moisture equilibrium of baby's skin. Milk softens and improves the skin’s texture. Ideal for use during the winter, Extra Moisturizing Baby Soap is free from artificial colours. Almond Oil is an excellent skin softener and moisturizer for baby's skin. Milk nourishes and softens, and is an effective moisturizer for baby's skin. Wet baby's face and body. 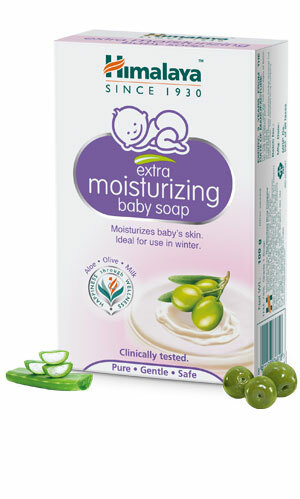 Apply Extra Moisturizing Baby Soap generously, gently working up a lather. Rinse thoroughly.